There’s nothing like a vacation to relax and leave your worries behind. That’s why you should choose a trip that gives you maximum enjoyment and entertainment during your time away. Here, the travel planners at DiMaria Travel Agency in Rochester, NY, suggest why a cruise is the perfect getaway for your next vacation. Why Take a Cruise on Your Next Vacation? There’s no need to limit yourself on vacation. On a cruise, you’ll stop at different ports on the journey. For example, trips to the Caribbean boast a variety of exciting excursions and sightseeing opportunities. You’ll have the chance to experience sea life up close on a scuba or snorkeling excursion. Enjoy a horseback ride along the beach or a trek through a nature preserve. There are many different activities and places you could try all in one go. One fee gets you a stateroom, plenty of food, and all the entertainment you could want. When you take a cruise, you can travel to a variety of ports without the added expense of airfare to reach your destinations. You also won’t need to book hotel rooms; you can simply return to the ship at the end of the day before sailing to your next destination. 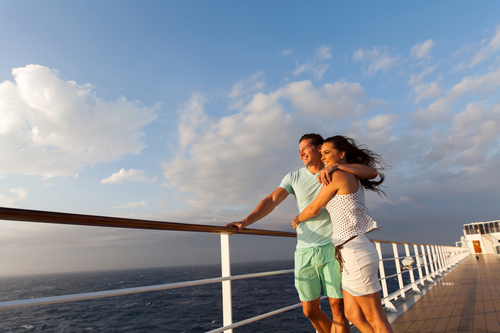 With a cruise, all you need to decide on is your destination and your stateroom. You won’t need to book a hotel, rent a car, or worry about food. It’s even easier when you use a travel agency to plan your trip. They will help you find the best cruise and will handle making all arrangements. Cruises are not only full of excitement, but they are also a budget-friendly, easy-to-plan vacation the entire family will enjoy. If you are ready to book a cruise for your next vacation, contact DiMaria Travel Agency. This family-owned and -operated travel agency has helped countless families plan unforgettable getaways. Call (585) 271-0100 or visit the website for additional information.